Call yourself a Genius? Then prove it! Mind game is built to challenge your Grey Matter. WARNING! This game will get you so addicted to it that you won't get to know how many hours just fly by! Match the numbers written on the sides of hexagons, and keep climbing the ladder of success. It keeps getting tougher with each stage, you will have to improve your skills as you progress in the game! Many interesting levels to keep you baffled. Match the sides with the same number to clear each level. All numbers on the side facing each other, must correspond. Eg – if the blue hexagon shows no. 2 then the adjacent pink one must show no. 2 also and so on. Mind Game is not a cake walk, it will use much more of your mind than you think. Better if you have a strategy. Outwit yourself by solving the puzzle in as little time as you can. 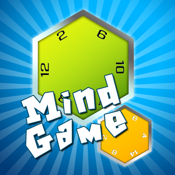 Exercise your mind with this addictive game of strategies! This game is perfect for you to sharpen and enhance your observation skills, your memory, calculation and reasoning abilities. Track your performance and watch your stats rise as you improve your mental skills each time you play. Compare scores with your friends on your iPhone/iPod Touch. You will have to keep your patience with this challenging game and have a strategy to win! Wear your thinking cap and get started - have fun! "Please don't leave negative remarks/complaints on this page. We do appreciate suggestions to make the application work better and would love to sort out the issues and your complaints.